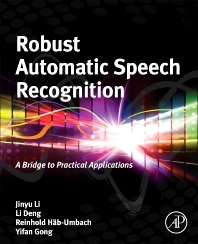 Robust Automatic Speech Recognition: A Bridge to Practical Applications establishes a solid foundation for automatic speech recognition that is robust against acoustic environmental distortion. It provides a thorough overview of classical and modern noise-and reverberation robust techniques that have been developed over the past thirty years, with an emphasis on practical methods that have been proven to be successful and which are likely to be further developed for future applications. The strengths and weaknesses of robustness-enhancing speech recognition techniques are carefully analyzed. The book covers noise-robust techniques designed for acoustic models which are based on both Gaussian mixture models and deep neural networks. In addition, a guide to selecting the best methods for practical applications is provided. Jinyu Li received a Ph.D. degree from Georgia Institute of Technology, U.S. From 2000 to 2003, he was a Researcher at Intel China Research Center and a Research Manager at iFlytek, China. Currently, he is a Principal Applied Scientist at Microsoft, working as a technical lead to design and improve speech modeling algorithms and technologies that ensure industry state-of-the-art speech recognition accuracy for Microsoft products. His major research interests cover several topics in speech recognition and machine learning, including noise robustness, deep learning, discriminative training, and feature extraction. He has authored over 60 papers and awarded over 10 patents. Li Deng received a Ph.D. degree from the University of Wisconsin-Madison, US. He was a professor (1989-1999) at the University of Waterloo, Canada. In 1999, he joined Microsoft Research, where he currently leads R&D of application-focused deep learning as Partner Research Manager of its Deep Learning Technology Center. He is also an Affiliate Professor at University of Washington. He is a Fellow of the Acoustical Society of America, Fellow of the IEEE, and Fellow of the International Speech Communication Association. He served as Editors-in-Chief for the IEEE Signal Processing Magazine and for the IEEE/ACM Transactions on Audio, Speech and Language Processing (2009-2014). His technical work has been focused on deep learning for speech, language, image, and multimodal processing, and for other areas of machine intelligence involving big data. He received numerous awards including the IEEE SPS Best Paper Awards, IEEE Outstanding Engineer Award, and APSIPA Industrial Distinguished Leader Award. Reinhold Haeb-Umbach is a professor with the University of Paderborn, Germany. His main research interests are in the fields of statistical signal processing and pattern recognition, with applications to speech enhancement, acoustic beamforming and source separation, as well as automatic speech recognition. After having worked in industrial research laboratories for more than 10 years he joined academia as a full professor of Communications Engineering in 2001. He has published more than 150 papers in peer reviewed journals and conferences. Yifan Gong served the National Scientific Research Center (CNRS) and INRIA, France, as Research Engineer and then joined CNRS as Senior Research Scientist. He was a Visiting Research Fellow at the Communications Research Center of Canada. As Senior Member of Technical Staff, he worked for Texas Instruments at the Speech Technologies Lab, where he developed speech modeling technologies robust against noisy environments, designed systems, algorithms, and software for speech and speaker recognition, and delivered memory- and CPU-efficient recognizers for mobile devices. Yifan joined Microsoft in 2004, and is currently a Principal Science Manager in the areas of speech modeling, computing infrastructure, and speech model development for speech products. His research interests include automatic speech recognition/interpretation, signal processing, algorithm development, and engineering process/infrastructure and management. He has authored over 130 publications and awarded over 30 patents. Specific contributions include stochastic trajectory modeling, source normalization HMM training, joint compensation of additive and convolutional noises, and variable parameter HMM. In these areas, he gave tutorials and presentations in international conferences. He has been serving as member of technical committee and session chair for many international conferences, and with IEEE Signal Processing Spoken Language Technical Committees from 1998 to 2002 and since 2013.